Collectible Art At Street Prices: Banksy Sells Pieces For $60 : The Two-Way New Yorkers who love a good bargain missed a golden opportunity Saturday, when the artist and provocateur Banksy, whose sly graffiti art adorns collectors' walls, opened a sidewalk kiosk to sell his work for $60 a canvas. An image from a video posted by Banksy shows a man representing the artist staffing a sidewalk stall featuring signed works for $60. Banksy says he only made $420 Saturday, with one customer negotiating a 2-for-1 discount. New Yorkers who love a good bargain missed a golden opportunity Saturday, when the artist and provocateur Banksy, whose sly graffiti art adorns collectors' walls, opened a sidewalk kiosk in Central Park to sell his work for $60 apiece. 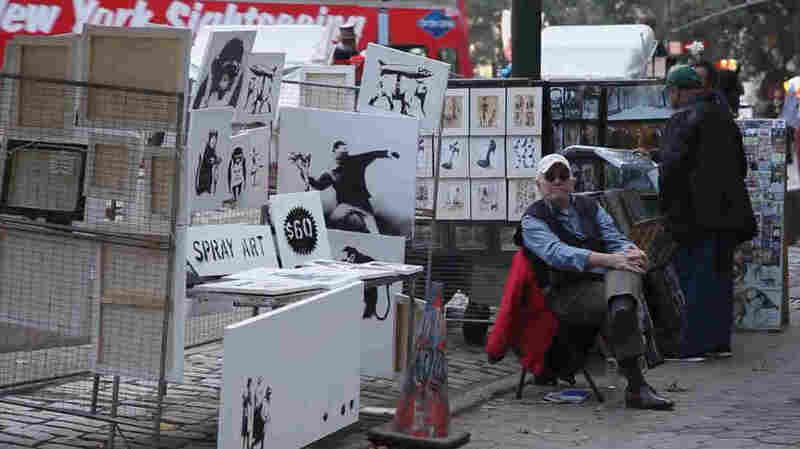 With original signed art works zip-tied to the wire walls of his kiosk, Banksy set up shop next to stenciled signs reading, "Spray Art" and $60." A video of the art sale shows the stall of Banksy's work being staffed by a gray-haired man who yawns as he sits in a chair, being ignored. His first sale came hours after opening, when a woman bought two canvases for her children. She negotiated a 50 percent discount on the pieces, according to the website of the anonymous artist who has sought to keep his appearance and identity a secret. The offerings included small and large canvases, including a version of "Love Is in the Air." A limited edition of that work sold for $249,000 at auction this summer. One text-based canvas took the form of a message reading, "The key to making great art is all in the compositio" — the "n" was cut off, as the final word ran off the edge of the canvas. A man who said he simply needed something to put on the walls in his new place bought four canvases. 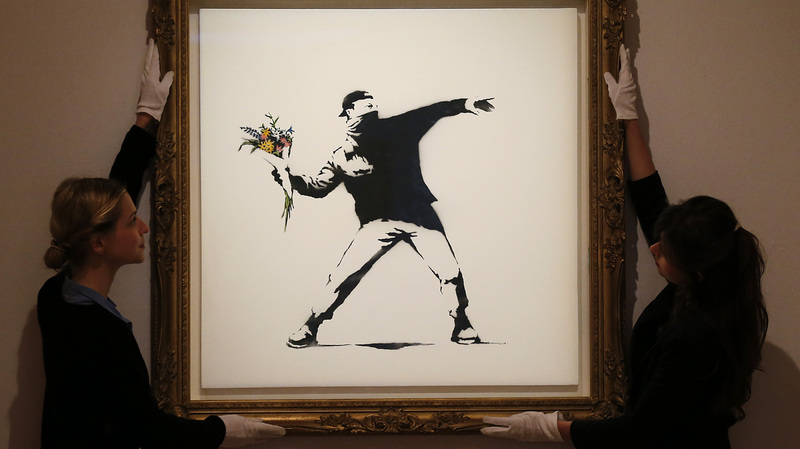 In total, Banksy took in $420 on the day. As Gothamist reports, "if the pieces are verified by Pest Control [Banksy's agent], they will literally be worth tens of thousands of dollars (we've contacted them to find out if they will do so)." At least two people who bought Banksy's art were planning to take their finds back home — to Chicago in one case, and New Zealand in another. They got hugs and, in one case, a kiss on the cheek from the man representing the world-famous artist, who is in New York for a month-long visit. A limited edition of Banksy's "Love Is in the Air" sold for $249,000 at Bonhams auction house in London this summer. The artist offeed a version of the work for $60 on the sidewalk in New York Saturday. "I know street art can feel increasingly like the marketing wing of an art career, so I wanted to make some art without the price tag attached. There's no gallery show or book or film. It's pointless. Which hopefully means something."